The sentiment means a lot to me as I often feel a sense of failure, having struggled for six-and-a-half years writing part-time trying to makes one manuscript work. I've heard plenty of professionals say that if one manuscript isn't working for you, move on to another one. But I don't like to give up on things, especially those I've built with my heart and invested years of my life in. Maybe there is a point where you stop and move on, so you can spend your time (your life) on something that will satisfy you and bring you success, even if that just means finishing something with which you are happy. Maybe I don't know when to let go and move on. Or maybe I am getting closer every day to creating something I feel is complete and is, as Zusak says of his work The Book Thief, "everything to me." Admitting failure doesn't have to mean giving up but recognizing that there is still a solution somewhere you've yet to look. There are other projects I want to finish and others I want to begin, and I have to trust that they will have their time. I don't want to take time for granted, but I can only work from where I am each day and hope I am lucky enough to have a future in which I get to keep writing. I am slow in most things I do, and at times it frustrates me because time is limited. Other people tend to swim much faster than I do. They are surfing in the ocean, while I am still working on getting out of the shallow end of the pool. Part of that has to do with my need to challenge myself, and part of it has to do with my need to accept that my small and large failures are teaching me something and will guide me in the right direction for me--to what looks like success to me. Those are some things this quote helps me remember, and maybe it can help motivate you too. At times when we are repeatedly hitting brick walls, we may just need to have some faith in the process and keep at the work. Too early is just as far off-target as too late. Even someone as successful as Markus Zusak knows--and can appreciate--failure. And, as he also said: "It's overcoming our insecurities and fears that makes us stronger and better and it's what gives success meaning." What helps you keep perspective at times when you feel a sense of failure? Thank you so much for this, Laura! It's a reminder I definitely needed as I plod through edits and wonder why I do this when it's so hard. One thing that helped me just today was reading through my last chapter. It's so easy to get caught up in the middle of a story, questioning where it's going and why it's relevant, and for me it was really encouraging to remind myself of the feeling I want the reader to have when they get to the end. 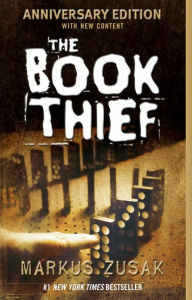 I love Markus Zusak, by the way - The Book Thief was amazing! That is great advice, Laurie, and something I will keep in mind. :-) Thanks for sharing!